The privilege of working with visionary customers is that you get to learn from their very focused experience and expertise. One excellent insight that I recently heard from one such customer is that the real challenge in technology and logistics is bridging the physical/digital divide. I.E creating seamless experiences that successfully traverse the ‘clean’ digital world and the ‘messy’ physical world and vise versa. This observation strongly resonated with us at package.ai given our mission of optimizing last-mile logistics through software. So it was an extra pleasure to watch one such ‘digital-to-physical’ scenario come to life. Daniel, our talented back-end developer, has been working diligently to improve the understanding and handling of feedback once a delivery has been made. 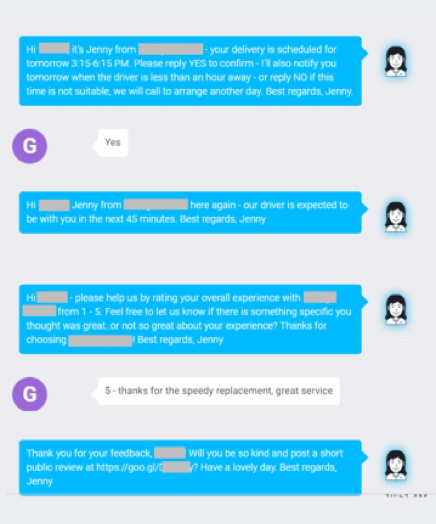 The thought was that if Jenny, our chatbot, can reliably distinguish positive and negative feedback responses, we would be able to attach real-business value to both ends of the spectrum (satisfied and not-so-satisfied customers). Once Jenny mastered this capability, she was able to prompt satisfied consumers to post a review online by including the direct URL in the SMS from Jenny. The first actual conversion, starting with a delivery time-window notification and ending with a glowing online review was all the proof we needed for a nailed scenario (kudos Daniel) and awesome business value for package.ai customers!